Shamballa bracelets have been around for centuries. The word Shamballa represents the mythical kingdom that Tibetan Buddhists believe symbolizes enlightenment, peace and perfection. Shamballa bracelets are based on the traditional Catholic rosary beads which are historically used for meditation. Beads are threaded and/or knotted onto a cord using macramé knots, each color having a unique meaning and purpose to promote an emotion or physical condition that you wish to develop. Most of all, they are tied to the symbol of oneness. While most people wear Shamballa bracelets as a fashion statement, it is safe to say that there are countless people who still understand the meanings and wear them for spiritual reasons. But as a fashion statement they are bold, unique and have a bohemian vibe to them. Choosing a Shamballa bracelet as a gift, regardless of gender, is a thoughtful gift. Bracelets can be made from Swarovski crystals, diamonds and other gemstones such as spinel or rhodolite, malachite, turquoise; the list of possibilities is endless. 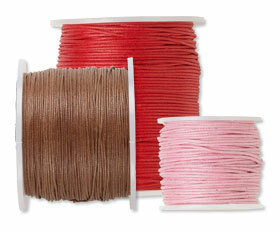 Waxed cotton cord as your beading material is popular and comes in a variety of colors. Shamballa beads such as ''disco ball'' beads and the crystal pavé beads are being used for this type of bracelet, especially the color of black for men. 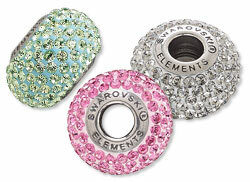 (Here are the Swarovski BeCharmed pavé beads, which add an exciting design element for high-end designs.) You can also use beautiful glass rhinestone ''disco ball'' beads. These rhinestones bring sparkling color and beauty to any design. Multicolored Egyptian crystal rhinestones are beautiful to use and have a stardust-like surface which enhances the sparkling shine. Be inspired by Shamballa bracelet designs in the Gallery of Designs, which offers wonderful designs and instructions on how to create your own unique Shamballa bracelets. 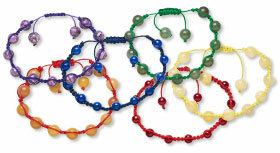 The colors of the original Shamballa beads were associated with the 7 colors of the Chakra. Each color of the Chakra is associated with a specific feeling of well-being. The colors that you select to wear on a Shamballa bracelet or the colors that you select to design a Shamballa bracelet may be the wish of well-being that you pass onto your customers. The most popular color for creating Shamballa bracelets is black, representing the absence of light and is associated with strength, authority and power. The color black is the most popular for gifts to men. The white Shamballa bracelet--white is not a color but a mix of all colors, or the color of perfection, bringing clarity and purity. A diamond beaded Shamballa is the most popular color of white when creating a Shamballa bracelet. Red Shamballa bracelets are associated with the base Chakra and linked to passion and sexuality. Orange Shamballa beads are linked to the balance of creativity and release of stress or blocks in your life. Yellow and gold Shamballa beads represent the sunshine center or third chakra associated with purpose, personal willpower and self-confidence. The chessboard round Swarovski crystals will add an incredible flash and brilliant play of color to your bracelet. Green Shamballa beads are related to the heart chakra and give rise to balance and harmony. Blue Shamballa beads bring expansion through communication and are associated with trust. Violet Shamballa beads represent the 7th Chakra, which is the Crown Chakra at the top of the head and associated with bliss and spirituality.